If you get hungry for Mexican food while vacationing in Grayton Beach or more specifically Seaside, FL then stop in at Bud & Alley’s Taco Bar and have a delicious taco, a burrito, chips and salsa or just have a margarita and walk over to the beach and watch the waves roll in. My usual fare when stopping in at the Taco Bar while on our week long vacation in Grayton Beach was a veggie burrito. I’d have to say, it was probably the best veggie burrito I’ve ever had. It should be for $7, and of course it was. (My wife helped keep the cost of our meals down by getting beans and rice which was only $2.) I also tried the shrimp burrito and it was equally delicious. I think we probably stopped in about 4 times, once for dinner and 3 times for lunch and I enjoyed every meal. We also stopped in once to get a margarita and it was tasty, but not cheap at $12. But hey, I was on vacation so I splurged. Bud & Alley’s Taco Bar is located right across the street from the main town square at Seaside which is just 3 miles or so from where we were staying in Grayton Beach. You can’t miss the place because it is probably the most colorful restaurant or shop on the beachside at Seaside. Most of the seats are outside the restaurant in the courtyard, but there is also a small bar inside he restaurant. 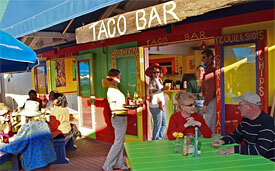 Enjoy a delicious lunch while vacationing along Highway 30A at Bud & Alleys Taco Bar. You will definitely remember this place. you can check out their menu here. Love this taco bar! Have great memories of lunches here with friends!